When kids have skipped breakfast in the morning rush, visiting the cafeteria is usually not an option. 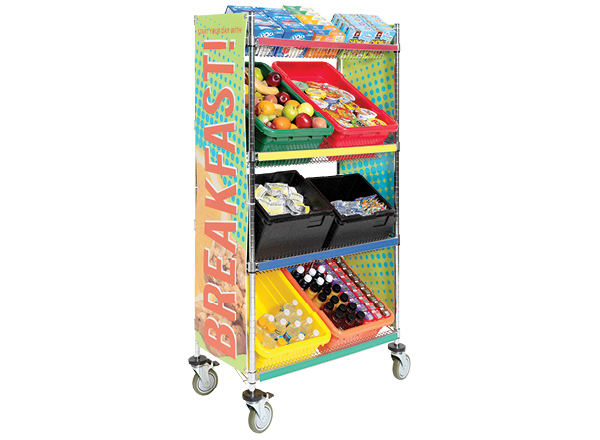 The mobile school breakfast cart is the perfect solution! Wheel it into the hallway so students see it as they walk in the door. Studies show that kids who eat breakfast are more attentive and focused on learning, often leading to higher test scores. 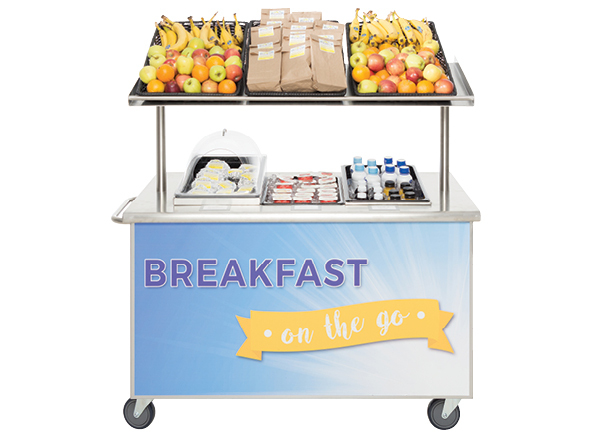 "The Breakfast Cart helped us bring food to the students in schools where time was restrictive and cafeteria location was not convenient. Hubert has been instrumental in helping us double breakfast participation in several secondary schools." Our Breakfast Cart Calculator shows how an improvement in breakfast participation can have the unit pay for itself very quickly. Enter your current breakfast participation and school enrollment. This will give an estimated number of students who eat daily. Enter your average meal price to see what breakfast currently generates daily and annually. In the middle box, you will project your anticipated participation (or if you have data after implementation, this will let you see what you are currently doing). You will see the projections on the meal. The lower boxes will show you how much of an incremental growth you will have. You will then see the number of days you will need to re-coup the cost of the cart and your return on investment. Make the morning meal a priority for your students — contact the Hubert Education Team today! Our Education team will contact you to discuss your goals and Hubert's solutions to help you create your Breakfast Program, on time and within budget.